FireFly stoves have a stainless steel mesh floor and weigh just 2.7 ounces, or 2.8 ounces with a FlexPort. My hiking socks weigh more! The FireFly assembles and comes apart easily and quickly, forming a flat package less than half an inch thick and going easily into even the tiniest pack in its pouch. Other wood burners are generally heavier and bulkier. The FireFly is now designed to work very well with the vast majority of pots that backpackers use, from small cooking mugs to large pots with a diameter of up to 6 inches. The fuel box below your pot holds 42 cubic inches of fuel. One loose filling of twigs will usually boil a couple cups of water, but it is easy to add additional twigs or other fuel as needed. The optional FlexPort allows you to feed longer pieces of wood into the firebox and is very popular, super useful for simmering, baking, and grilling food. The stove is easy to light from either underneath the mesh floor (bottom lighting), through an open FlexPort (side lighting), or with a small fire started on top of a twig load (top lighting), and has a strong chimney effect to get twigs burning quickly. To slow down the burn with an open FlexPort, you can use the optional titanium foil insert to reduce bottom ventilation. The FireFly UL is made from a thin ultralight titanium sheetmetal that is both durable and lightweight. Each of the four sides are stamped identically in a pattern that allows them to be assembled in just a few seconds, and torn down just as fast. With all four sides assembled together, the stainless steel screen fits in the bottom locking the four sides together and to hold up the organic fire material while allowing a generous amount of air to enter from the bottom. The fuel box is designed to hold as much as 42 cubic inches of organic fuel including pine cones, wooden shavings, and a mixture of small twigs and pieces of bark. One filling should be enough to boil a couple cups of water, but additional fuel can easily be added as necessary. In the side of one of the panels, there is a wide FlexPort door that can be opened to allow longer material to be fed into the stove. Fully assembled, the stove is fully capable of supporting up to a 6″ pot or frypan. Anything smaller, and you will need the optional small pot supports or you can just make your own from a wire hanger. As the air enters from the bottom, it causes the fuel to burn much hotter and much more efficiently. Very similar to how a rocket stove works. There is no integrated ash pan to protect the surface that you stove is sitting on, so if you are concerned with scorching the ground below the stove, you will need to purchase one of the optional ash pans. There are many other lightweight optional accessories and enhancements available for purchase on the QiWiz website to further enhance and extend the functionality of the FireFly UL stove as well. Some of these include a grill, Hexamine fuel tablet adapter, titanium foil and a small reinforced tyvek pouch to stow the kit in. If you need to go bigger, there is a larger version of the ultralight stove called the FireFly XL that is also available from the website. To build my fire, I filled the firebox with small kindling and twigs, then topped it with some wood shavings and a saturated cotton ball. One strike with my firestarter and the fire was off and running. Within 4 minutes I had a pot of boiling water. 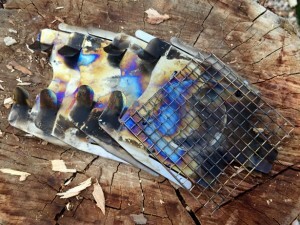 Shortly afterward, the fire burned out and the stove cooled down enough to break it apart and pack it away. 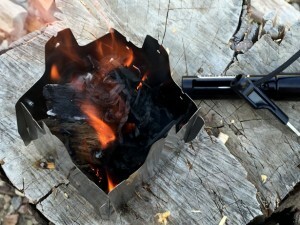 For being made from a thin ultralight titanium sheetmetal, the stove is very compact and packs away in such a small amount of space, you might forget that you have it. At only 2.8 ounces, I would much rather cook on one of these than one of those flimsy Hexamine fuel tablet stoves that way nearly as much. However, I would rather see the ash pan integrated in some way and most of the accessories should be provided with it. Especially the storage pouch. The stove is coated with ash and a nasty black soot and it tends to get on everything so having some sort of protective pouch to contain the mess would be a huge plus. Anyway, I am a persistent gear tweaker, having modified or enhanced just about everything I use for backpacking. Most projects are just for my personal enjoyment, but as you can see, it did not end there. As time goes on, I may be adding some additional projects to the current list of gear I make and sell.